Biology Conan the Bacterium – The world’s most resistant organism? Conan the Bacterium – The world’s most resistant organism? 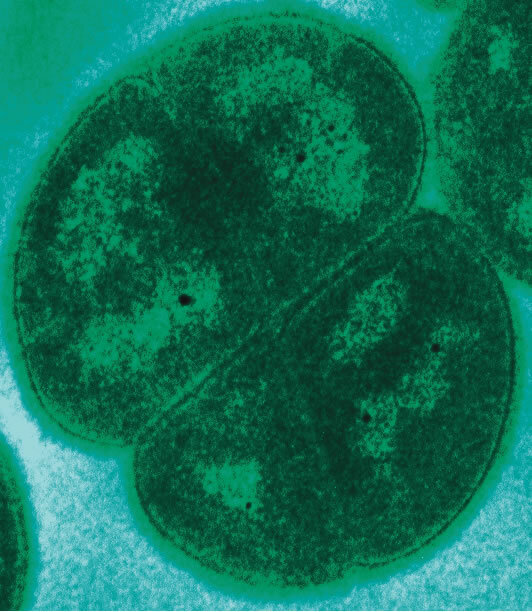 Deinococcus radiodurans is nicknamed “Conan the Bacterium” because, like Robert E. Howard’s Cimmerian hero, it can withstand and survive more than you would expect it to. It was first discovered in 1956 by Arthur W. Anderson at the Oregon Agricultural Experiment Station. He was trying to sterilise meat by irradiating it with gamma radiation. He thought that if he could kill all the bacteria present, the meat would not spoil. However, our tiny little friend Conan survived and the meat eventually spoiled. This bacterium can withstand radiation exposures of 5000 Gy (Gray, the measure of absorption of ionising radiation). In comparison, an exposure of 5 Gy is fatal to humans, the typical Apollo mission or x-ray would involve an exposure of 1 mGy, the bacterium E.Coli is killed by an exposure to 200-800 Gy. 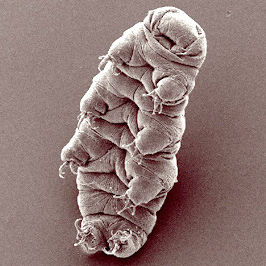 The most radiation resistant animal, the tardigrade (also known as waterbear) is able to resist up to 4000 Gy. The radiation chops up Conan’s genome, but it can stitch it back up in the space of a few hours, and the new genome is as good as new. We are not entirely sure why this bacterium would evolve such a high resistance to radiation. After all, background radiation in nature is only of the order of half a mGy a year, and in the most radioactive area in the world, Ramsar in Iran, it is only 260 mGy a year. A proposed reason is that the radiation resistance is a side-effect of evolving a very strong resistance to dryness (a trait shared with tardigrades). According to NASA Conan’s “genetic code repeats itself many times so that damage in one area can be recognized and quickly repaired”. There is hope that it can be genetically modified to produce medicines for astronauts, its resilience considered a very useful characteristics, as redundancy is fundamental in space missions. In 2003 a team of scientists from the US used deinococcus radiodurans to store information. They took words from It’s a small world and translated it into DNA and inserted it in the bacteria. 100 bacterial generations later, the DNA chain was intact. Because of their radiation resistance, deinococcus radiodurans could be used as information storage that could survive a nuclear catastrophe. Another application of this bacterium is to use it as a detoxifier in highly radioactive environments. For example, scientists have developed a strain of this bacterium that can detoxify ionic mercury, by cloning the mercury reductase gene from E.coli and inserting it into deinococcus radiodurans. Ionic mercury is found in radioactive waste produced by the manufacture of nuclear weapons. Tardigrades are pretty tough cookies themselves. They only measure one millimetre long when they’re fully grown and have 4 pairs of tiny legs. They are called water bears because their walk is similar to the gait of a bear. They are one of the most complex extremophiles (organisms that thrive in very harsh conditions), they can survive temperatures from close to absolute zero to 150 degrees C (50 degrees higher than the boiling point of water), they are very resistant to solar, ionic and gamma radiation and can go for a very long time without food, up to 10 years. 10 years! In that period they get so dry that their water composition drops down to only 3%, but once they are rehydrated they can keep going as if nothing happened. There is a report of a dried up tardigrade that after having been dry for 120 years exhibited leg movement, but scientists do not consider this ‘survival’. Oh, and they can also resist pressures higher than those found at the bottom of the Mariana trench (nearly six times as much in fact, 6000 atmospheres!). In fact, Conan the Bacterium is not the most radiation resistant organism that we know of anymore. Thermococcus gammatolerans was discovered in 2003 near hydrothermal vents in the Guaymas Basin. It can withstand 30 thousand Gy! But it still does not have a clever nickname, so it’s a bit less well-known. What do you think? Should we come up with one? Leave your suggestions in the comments. Thermococcus gammatolerans AKA Keith Richards. Coccus Hulkos, eventually. Because it’s green and likes gamma rays.